A luxury Villa, the B and B la Tana del Riccio is a most charming Guest House for rental in Salento, among the very best accommodations in Apulia, in Southern Italy. A boutique vacation home ideal for couples and friends looking for a friendly and elegant atmosphere. In a surprising small 15th C. borough close to the best sea villages, the B&B La Tana del Riccio is a most charming Guest House for rental hidden in the heart of Salento, in southern Italy, a boutique vacation home where you’ll feel back in the ’60’s. Within short distance from the B&B Guest House Salento La Tana del Riccio, a luxury villa in southern Italy and among the best accommodations in Puglia, there are several accesses to the beautiful coast on the Adriatic or Ionian seas, providing rocks and deep waters, to sandy and shallow beaches. A luxury villa, the B&B|B and B| Guest House La Tana del Riccio provides all comforts (breakfast and WI-FI included) in a private and friendly atmosphere with services that can be personalized inside an extraordinary context, Vaste, a gift from history and a comfort itself for the soul. 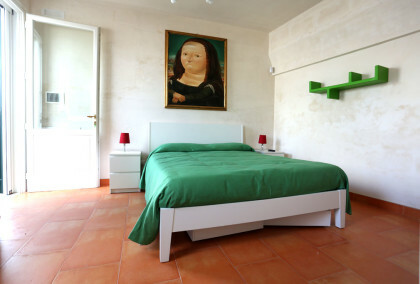 The Bed and Breakfast Tana del Riccio, recently renovated to be a cozy and welcoming design boutique B and B and a vacation home maintains the classic and spontaneous architecture of an anchient house in Salento. Your staying in the B&B Guest House La Tana del Riccio will allow you to enjoy and learn from the Salento lifestyle, land of great culture and party time. The main square in Vaste itself, close to the Vacation House, is often used for art festivals, by musical bands, classic or jazz concerts. A luxury Villa, the Bed and Breakfast la Tana del Riccio is one of the best accommodations in Puglia, in the Salento Province. 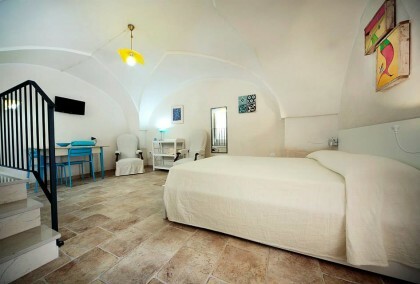 A most charming Guest House in Southern Italy. A boutique b and b and a vacation home ideal for couples as well as groups of friends and those looking for a friendly and elegant atmosphere. The Inn is characterized by its 15th century architecture, star shaped and vaulted ceilings and by a spectacular skylight that brings the sky into the heart of the house. Only 4 Suites. Up to 10 sleeps. A fully furnished kitchen, spectacular Terraces, a small garden are beautiful common spaces to share. In Vaste, a surprising small 15th C. borough in the inland of beautiful villages along the adriatic coast, such as Castro and S.Cesarea Terme. Vaste exemplifies the past life traditions of an Italy of the 60's. and The Tana del Riccio enjoys a strategic location that provides close access to the main road which allows you to be less that a half hour from Lecce, Otranto, Gallipoli, and Santa Maria di Leuca. Gay friendly. Italian Breakfast, Wi-Fi, TV, BBQ, daily cleaning. Minimum stay: 3 nights. 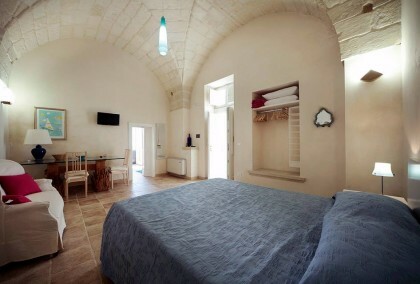 Ideal for families with children, this Suite has an area of approximately 45 square meters, a very high vaulted ceiling that allows a loft connected by a brick staircase built using the local technique. 2-4 sleeps. Located in the upper level from the atrium, this Grand Suite of 40 sq.m. 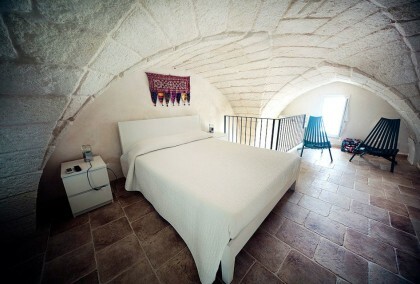 has a main room with a breathtaking 5 meter vaulted ceiling, that provides the name to the suite. 2 sleeps. It is dry and cool in the summer and can be completely autonomous and private from the rest of the Inn. Located on the terraces area and isolated from the atrium area, this 20 sq. meter Suite is decorated in tones of Mediterranean orange and beautiful orange ceramic tile. 2 sleeps. Tana del Riccio… ti accoglie nel sole abbacinante del Salento, nel silenzio assoluto di Vaste. E la luce ti accompagna dentro con il cielo azzurro che sovrasta la cucina salone attraverso un lucernario spettacolare. Poi, poi…è il regno degli angoli e angoletti: le stanze tutte diverse dove si può passare il tempo a studiarne i dettagli tra ricercatezze e curiosità, il giardino fresco riparato dal muro di cinta e le terrazze. Quasi quasi, neppure si esce! Eppure, quando poi recuperate rapidamente le energie che ti regala questa stupefacente Guest House col cielo che entra in casa illuminando l’atrio od offrendoti uno spettacolo di stelle nelle notti piu’ luminose, non vedrete l’ora di scoprire man mano tutte le meraviglie di questo territorio, Basta procedere lungo la litoranea che porta da Otranto fino all’estremita’ del tacco a S.Maria di Leuca per essere colti dall’imbarazzo. Dove sostare… si vorrebbe nuotare in ogni caletta, esplorare ogni grotta, fermarsi a gustare il panorama dopo ogni tornante. E tornare al tramonto per una scorpacciata di ricci e un buon bicchiere di vino. Col pulmino Peace and Love della Tana e’ un divertimento che strappa il sorriso anche chi si incontra lungo il cammino. Provate per credere.